Our school is still on the traditional curriculum. Our students do Algebra 1, then Geometry, then Algebra 2. I’m sure that they remember everything from two years ago, but just in case, I always try to be a little proactive at the beginning of the year. Last year I incorporated Delta Math at the beginning of the year for students to practice basics and Algebra 1 skills on a weekly basis. I found it immensely beneficial as it reacquainted the students with skills they had learned in the past, but needed refreshing. This enabled me to spend more class time on Algebra 2, instead of reviewing Algebra 1. For this year, I decided to extend that program by starting in the summer. My school allows students to take any class they have the pre-requisite for, even if they were not recommended. We have two levels of Algebra 2, and I teach the more advanced level. I have a fair number of students this year that were not recommended for the advanced Algebra 2 class, but have chosen to take it. So, I must be deliberate in structuring Algebra review and support so that these students can have the greatest chance of success in my class. Optional Algebra 1 Summer Assignment on Delta Math: There is one question per topic (40 topics total). The questions range from rounding to factoring. I did not want to make it too difficult, as I do not want students frustrated over the summer. There is only one assigned question per skill, but since it is on Delta Math students can answer multiple questions if they would like more practice on a certain skill. As you can see, this student choose to do multiple problems on several skills, even though I only assigned one. It only shows the number of CORRECT problems in the Record. In the overview I can also see which skills students felt they needed to practice more. Pre-Assessment: In the first week back I will give my students a pre-assessment on Algebra 1 skills similar to the problems from the Delta Math Assignment. I grade the pre-assessment by assigning each skill a concept score, B(Beginning), D(developing), or P(Proficient). 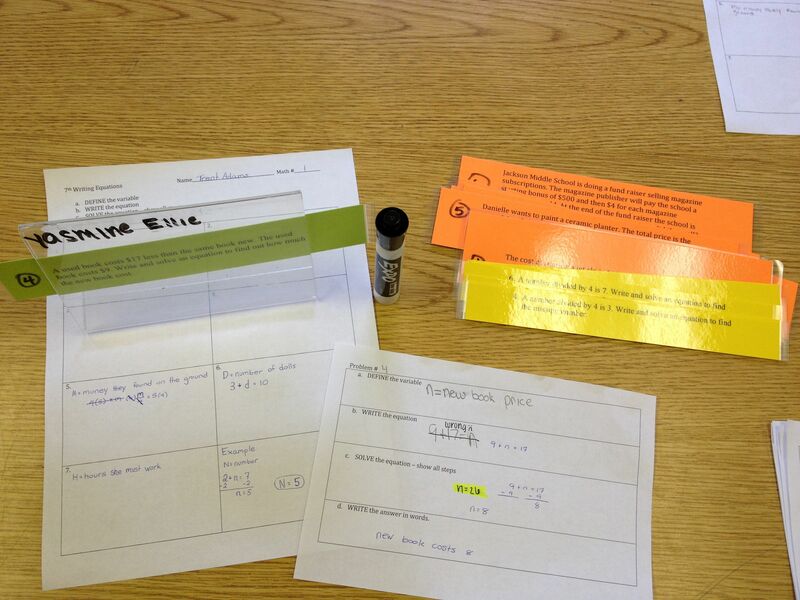 This will help them determine which Algebra skills they need more practice on. I do not record the pre-assessment score in my grade book. They will retest in at a later date for an actual grade. After the pre-assessment students need to review (or relearn) concepts so they can strengthen their Algebra skills and have more success on the upcoming Algebra assessment. I teach freshmen and sophomores and I know it is difficult for some students to do this on their own, so I provide the following to support them. I have an Algebra 1 Concepts Review Sheet that I will give to all of my students. I hold help sessions during lunch and after school to help students with basic algebra skills they are still struggling with. I leave the Delta Math Algebra 1 Review Summer Assignment up so students can keep working on skills. Writing Word Problem Equations – Help! Please help me make this lesson better. The main problem was that the students did not get to practice enough problems (the rotation and the checking slowed us down). Each student received their own answer sheet to record their work. Each partner group received a word problem and a small answer sheet that went with the word problem. Write the solution in words to see if it makes sense. 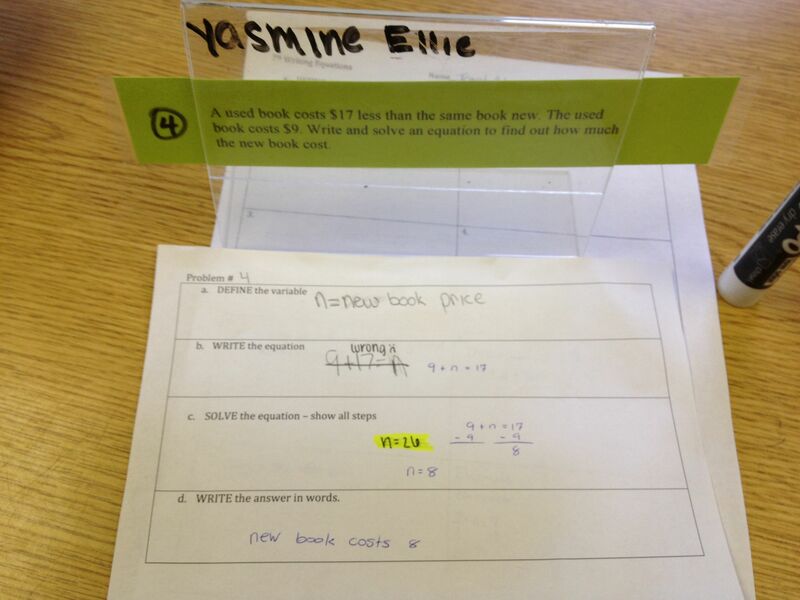 I had color coded word problems (by level of difficulty) and used my table top dry erase frames to put them in. This made reading the problem and passing it easier. Also, at each step the new partners checked the past work, and made corrections when a problem was incorrect (as well as noting it on the sheet). I liked the thought of this idea. But, all of the passing seemed confusing. I also felt that the students did not receive “closure” with any one problem. And, we only were able to get through three sets of word problems, so I don’t think that the students got enough practice. Plus, it was too “teacher directed” and high maintenance. I like it when the activity runs itself so I am more available to walk around and help students. I would love to make this activity better. Help! Dry-erase necklaces are at it again! I cannot tell you how much I LOVE these things! Today, I had my students choose a term (x, y, xy, x², 5, -1, 4) and write it on their dry-erase necklace. THEN, if they chose x, y, xy, x², they had to add a coefficient to their term. This was great because students had to look up exactly how to write a coefficient if they forgot – and several did. I went around the room and wrote everyone’s individual term on the board (16 terms total). I told my students to get up and find other people that were “like” themselves. After they were in groups with their like terms, they had to add write all of their terms on a small whiteboard and add them up. Then, they had to “arrange” the entire room (all of the final terms) into standard form. I then wrote the final terms on the board. First, does -1 go with 4 and 5? YES – they are all constants, so they are “like”. Who goes first around the room? x² was largest so it goes first, constants went last. It was fun watching them rearrange themselves, and each other! They were really impressed with their gigantic algebraic expression, and the resulting smaller expression. After this, they all grabbed white boards and we simplified many more algebraic equations. My students usually get that 5a + 2b cannot be combined (apples and bananas), but have trouble with x and x². Today was no different, and even after the activity they still wanted to make 9x + 2x² = 11x². But, it was very helpful to be able to say, “When you got into groups, did the x’s go with the x²’s?” They really seemed to get it better after that.